St Augustine is celebrating our 450th birthday with wonderful events throughout the year. Here is a great list to get you started. Check back with us each quarter as we give you a new list of what is coming up for the next few months. We’ll add more as they are added to the lineup. Pick your month and find a great list of events just right for your Historic Florida Getaway. Besides this list of fabulous happenings there are also many great displays and demonstrations that will be ongoing throughout the year. Archaeological Dig at Ximenez-Fatio House – Under the leadership Carl Halbirt, chief archaeologist for the City of St. Augustine, a major archaeological dig will begin at the historic Ximenez-Fatio House Museum. The project is expected to produce artifacts dating back to the original town plan of 1572, as well as from the early territorial and statehood years of 1821-1861. The project is open to public viewing from 11 a.m.-3 p.m. on Tuesdays through Saturdays. Spanish El Galeón – Andalucia – The full-sized replica of a 16th century Spanish ship, El Galeon is open for tours at the St. Augustine Municipal Marina. Named Andalucia, it is an exact replica of the famous galleons that played such an important role in the creation and maintenance of the Spanish Empire. It is similar to the galleon that brought Pedro Menendez to Florida where he founded St. Augustine in 1565. The ship is available for tours from 10 a.m. – 6 p.m. daily. What: Open jam session to anyone. Bring an instrument or just come and listen to the music. Admission is included in the regular park admission. $8 per vehicle (discounts available for single occupant or walking/bicyclists. What: This special evening celebrates the 496th birthday of Don Pedro Menéndez de Avilés, St. Augustine’s founder, and features a cocktail reception, dinner, dancing, re-enactments and other fun entertainment. What: Searle’s Sack of St. Augustine is the annual event that re-creates the bloody pirate raid of St. Augustine. This deadly raid was led by Robert Searle in 1668 when he and his crew laid siege upon the city and its inhabitants. This living history event is made up of two parts; a historic encampment and an authentic battle. 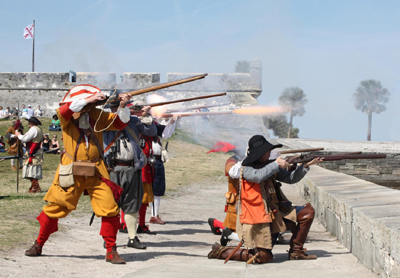 What: Learn how women contributed to the colonial survival of St. Augustine at this special living history presentation at Fort Matanzas National Monument. From 10 a.m.-3:30 p.m., re-enactors dressed in colonial clothing demonstrate spinning, weaving, felting, knitting and natural dyeing. Admission is free. Fort Matanzas is located on A1A 14 miles south of St. Augustine (four miles south of SR 206). What: Paddle back into time and experience the estuary as it was when the Timucuan Indians made it their home. Gain an enlightened understanding of the Timucuan culture on this guided tour that recreates the sights, sounds and aromas of the traditional Timucuan encampment. What: This event commemorates the founding of Fort Mose and the granting of freedom to its residents. This day also celebrates the free Black Militia, which traces its origins back to 1683 when it was first constituted by the Spanish Governor Juan Marquez Cabrera. Join us for a proclamation ceremony and a special presentation. What: St. Augustine Race Week is a brand new spring sailing event combining large-boat ocean racing and spectator-friendly small boat racing along the St. Augustine waterfront. The four-day regatta, April 9-12, 2015, coincides with St. Augustine’s 450th birthday and celebrates the first city’s colorful maritime heritage. Sailors from Savannah to Daytona are scheduled to race offshore in yachts from 24 to 50 feet long. The downtown races will feature a fleet of junior sailors in Optimus Prams and 420 dinghies. What: Celebrate the arrival of spring in the Nation’s oldest city with two days of flowers, friends and fun. Growers, nurseries, crafters and artisans from around the state offer gardeners everything they need to make spring bloom at the “Flower and Garden Expo,” The Garden Club of St. Augustine; Flower and Horticultural Show. This year’s floral design exhibit is titled 450 Years in the Oldest City. There will be ample free parking. Admission: $5 for a two-day pass, children under 12 are free.